Frazer-Nash Senior Consultant, Tom Coe, recently gave naval architecture lectures and on-water instruction to volunteer rescue boat crew as part of the Atlantic Pacific International Rescue Boat project at UWC Atlantic College. Tom's naval architecture and lifesaving background provided him with the perfect expertise to deliver both lectures in boat design, and water-based instruction in boat-handling skills, to the students attending the summer school in July. "The students are trained both to crew the lifeboat, and to provide that training to others, as some will be travelling to Japan in August to develop a new search and rescue organisation there. Others are already volunteering in Lesbos providing trained rescue crew where they're needed. More Atlantic Pacific volunteers are preparing to go to Greece and Libya, and I'm hoping to go to Malta in September, to help provide rescue boats there. "As well as the hands-on training, I was able to talk to the students about how fast boats work, and about the key requirements influencing the design of search and rescue craft. We discussed how our rescue boats could potentially be improved, and they came up with some great ideas." 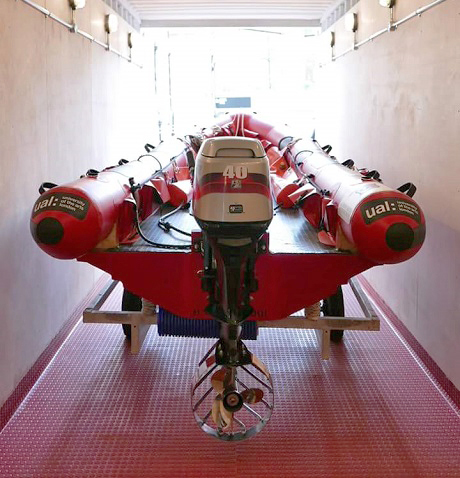 Taking the form of a shipping container, the 'Lifeboat in a Box' provides a boathouse and workshop for a Rigid Inflatable Boat (RIB), plus a crew changing room. A similar RIB lifeboat, built by UWC Atlantic College students, was taken to Lesbos in Greece in December 2015, and is helping with the humanitarian rescue of refugees from the war in Syria, who had been crossing the sea in unsafe boats. Built by students at UWC Atlantic College in Wales and Chelsea College of Arts, the craft was developed by Robin Jenkins, RNLI volunteer and design lecturer, from the original RIBs first built at the College in the 1960s**. Robin was inspired to produce the boat following a visit to Japan in 2014. During his visit, he heard that many victims of the 2011 earthquake and tsunami had died after being washed out to sea, as there were no boats that could help to rescue them. In May 2016 the first 'Lifeboat in a Box', named Hahn 001, was shipped to Kamaishi, a Japanese city affected by the in the tsunami. Robin, the Atlantic Pacific team, and students from UWC Atlantic College will visit Kamaishi in August 2016 to train local residents in how to operate the lifeboat. The second boat, Hahn 002, is intended for Malta in September, to help with the rescue of refugees in danger of drowning as they escape from war-torn Syria. **A whole other story, the RIB in the form we know today was invented at the College in the sixties as a radical solution to providing rescue cover for its sailing activities. Boats were built up to some 36 feet by students. One example 'Psychedelic Surfer' was entered in the 1969 Round Britain Powerboat race, attracting the interest of the RNLI. The College helped the RNLI to develop its first Atlantic 21 class lifeboat, and sold the patent for the design to it for £1. In 2012 the College received an old boat it had built in the 1960s from a local sailing club, and this has inspired a new generation of boatbuilding at the School. Naomi has been officially recognised as the oldest RIB in the world, and in 2015 the ImechE recognised both her and the College with an Engineering Heritage Award for their place in British Engineering history. Red Mist, on station in Lesbos, and the Hahn class vessels are a direct development of Naomi.